modern GUI (Graphic User Interface) design where the layout is done in FXML, not code. I have not used it yet. What is needed is much more layout intelligence so you just specify the data you want, not the layout and the run time lays it out in using styles, similar to CSS (Cascading Style Sheets). It uses FXML, a type of XML (extensible Markup Language) to describe user interfaces without writing Java code, yet all the code is written in standard Java. It is not a new language. Each component has only one event handler. It handles all possible types of event. I could not run any of the sample apps until I installed both the 64-bit and 32-bit runtimes. Opera would not work at all. Firefox froze, even after restart. Eventually it gave me a chance to start a new session. Chrome put up an almost invisible extra prompt asking me if a really, really wanted to run Java. Gak! Oracle is somewhat vague on just what JavaFX does. I suspect it allows you to write hybrid apps that will run unmodified standalone on a desktop, as Applets in browsers or in cellphones. JavaFX supports a way of doing 3D drawings without writing Java code, just parameters to describe geometrical objects, something like Pov-Ray (Persistence Of Vision Ray). NetBeans has special facilities for JavaFX. I have heard it described as stripped down Swing, an Ajax replacement and a Java-based Flash. I am reminded of an old Saturday Night live skit with Gilda Radner, Chevy Chase and Dan Akroyd. 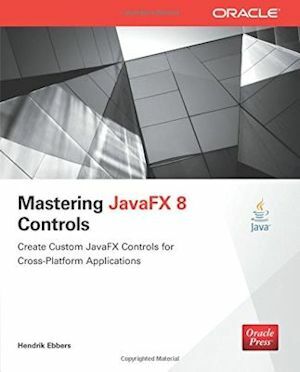 JavaFX supports JMC (Java Media Components). 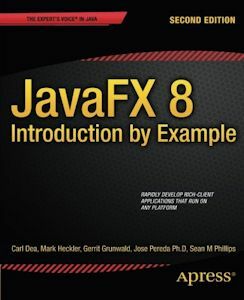 Unlike many other books, this covers JavaFX 1.8. It works with annotated code snippets. For the intermediate to advanced user. It explains how JavaFX works. Covers gesture devices, 3D display, embedded systems, and other advanced topics. 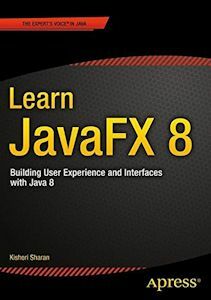 Unlike most JavaFX books covers Java 1.8. the successor to JavaFX 2.